Natural disasters forced almost 22 million people out of their homes across the world in 2013, according to the estimates released by the Internal Displacement Monitoring Centre (IDMC) of the Norwegian Refugee Council. Asia was the worst affected, with 87 per cent or 19 million people being displaced by weather and geophysical hazards like floods, storms and earthquakes, the report said. This number is expected to grow in the coming years. 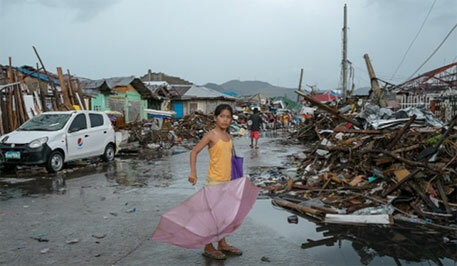 Typhoon Haiyan, which ravaged the Philippines in November 2013, displaced 4.1 million people, the highest number of displacements caused by any single event last year. This number was one million more than in Africa, the Americas, Europe and Oceania put together. Since 2008, Asian countries like the Philippines, China, India, Bangladesh and Vietnam have recorded the highest displacement levels. The flash floods in Uttarakhand, floods in other states and Cyclone Phailin in Odisha and Andhra Pradesh are estimated to have displaced at least 2.4 million people. In Africa, monsoon floods in semi-arid countries like Niger, Chad, Sudan and South Sudan also forced people to leave their homes in large numbers, resulting in some of the largest displacements relative to population size. The problem of displacement is compounded by droughts and long-standing conflict in the region. With Africa’s population predicted to double by 2050, the report fears that people’s exposure to hazards and displacement will only rise in the coming years. Developed countries were also affected by weather-related events. 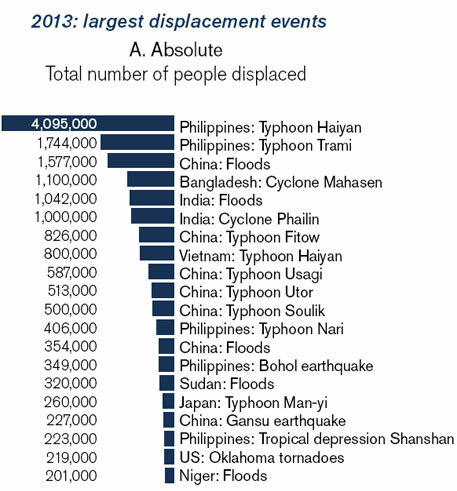 Typhoon Man-yi in Japan, tornados in Oklahoma, USA, and floods in Alberta, Canada, caused mass displacements. The risk of displacement by such events is estimated to have doubled since 1970. “Weather-related hazards are linked not only to normal variability in weather patterns, but also to long-term changes in the global climate that are expected to cause more frequent extreme weather events in the future,” explains the report. Though the report notes that changes in climate over the next couple of decades will be smaller than the year-to-year variability, it calls on governments to ensure that climate change adaptation policies take into account the vulnerability of populations to displacement. Displacement due to Weather disasters doubling since 1970 is nothing to do with global warming but it is mainly due to growth in population and more particularly along the vulnerable zones. In addition to this the destruction of water bodies through illegal encroachment [Example - Uttaranchal & J & K floods]and on the name of developmental activities. Appreciate if authors stop making adjectives like climate change a defacto global warming to every incident.